(l-r) Jimmy Kibati, general manager Marketing and Business Development, Kenya Airports Authority; Jonny Andersen, managing director, Kenya Airports Authority; Peter Kristensen, Panalpina Country Manager Kenya; Stefan Karlen, Panalpina president and CEO. 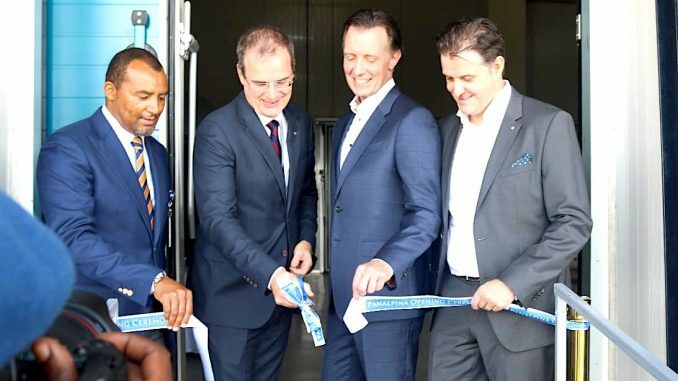 Panalpina doubles its cold storage space at Nairobi’s Jomo Kenyatta International Airport (NBO) as it taps a growing perishables demand in and out of the country. The facilities have been expanded by 1,500 sqm with a set-up that is unique within Jomo Kenyatta Airport. Panalpina’s 3,000 sqm facility is the only one with dedicated loading bays for skidded or palletised cargo and with separate cold rooms to manage specific temperature requirements for products such as cuttings, it says. The expansion further strengthens what Panalpina says is a leading position in Kenya, with the Swiss company flying most of Kenya’s premium perishables out of the country. “This facility will provide many business opportunities for our customers to pursue in [Kenya], the region and the world, and that is what we are looking to achieve – solutions that foster growth for our customers, Panalpina and the communities where we operate,” says Stefan Karlen, president and CEO of Panalpina. “When we deliver a Kenyan rose thousands of kilometres from Nairobi, we do it with the same care as when it was picked and handled by those working in the fields near Naivasha, Nakuru, Timau, or Thika,” he says adding that it is only possible together with specialised and trusted partners. Panalpina aims to grow its business in Kenya from the current 65,000 tonnes of flowers, fruits, and vegetables it moves, to more than 80,000 by 2020. This, it says, will bring increased benefits for the local community in terms of employment and infrastructure, as well as sustainable development. Panalpina first started operations in Nairobi in 2015 with a team of five people, which soon grew to 200 with the acquisition of Airflo and later to 350 with the addition of Air Connection. “Thanks to Panalpina’s investments in the perishables sector, Kenyan products are becoming more prominent in existing (mostly European) markets, but also in new ones, for example in Asia-Pacific,” says Panalpina. Panalpina’s growth in perishables has continued elsewhere in Africa, as well, with Skyservices in South Africa joining the Panalpina family earlier this year and FX Logistics, a new agent in Zimbabwe, also becoming a member of the Panalpina Perishables Network. Today, the Panalpina Perishables Network spans 26 key countries worldwide. Panalpina doubles its cold storage space at Nairobi’s Jomo Kenyatta International Airport as it taps a growing perishables demand in and out of the country.